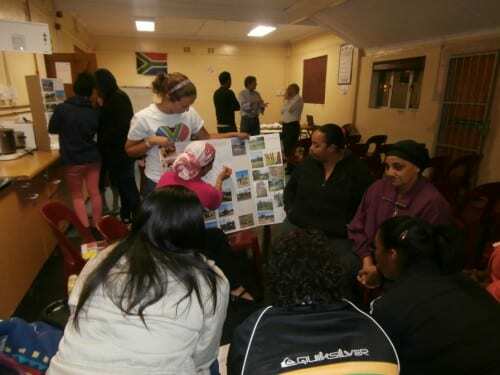 After many weeks of working in Maitland Garden Village and with the City of Cape Town Parks Department, we are ready to present design ideas to the community in an interactive setting. The preparation for the event on Tuesday evening involved meeting with Jude to finalize CAD models of the park. The models mapped out specific zones dedicated to toddlers, youth, and adults. 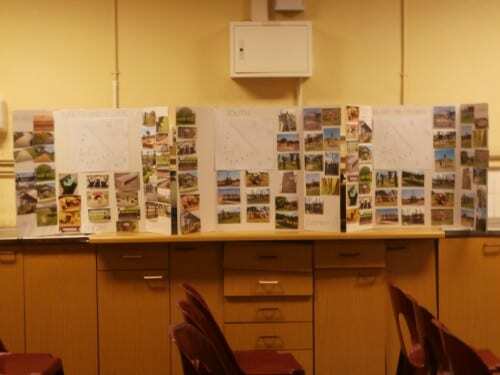 In addition to the CAD models, we also printed pictures of equipment, seating, shade, and pathway options that we had observed in other parks in Cape Town and are possible to implement in Perseverance Park. We displayed the photos on three poster boards tailored to specific age groups: toddlers and their parents, youth, and adults/elderly. The boards act to facilitate discussion about which equipment the community would like to see in the park and where they would place it within the park boundaries. We created a PowerPoint presentation to show the community what we have accomplished thus far and to express the importance of their involvement with the park redevelopment once we leave Cape Town. To ensure that everyone who has been working with us thus far was involved in the presentation, we met with Naiela, Ronell, and Jude on Monday for a dry run of the event so that everyone was comfortable with what they were going to say. With that, we all felt prepared going into Tuesday evening. The cab pulled into Maitland Garden Village around 5 o’clock in the evening. Although the meeting did not start until 7:30, we still had to assemble the pictures boards, one for toddler/parents, one for youth, and one for adults/elderly. The toddlers and parents board displayed equipment, seating, and shade options. The youth board had various equipment and seating options. The adult board had seating, shade, pathway, and barrier options. Once the boards were completed, Naiela had arrived with the projector. We decided to test the PowerPoint on the projector to avoid technical difficulties during the presentation. It was a good thing that we did. As Naiela began setting up the chairs in the room, Lucine and Katherine plugged in the projector and waited to see the red power light blink on. We waited, but it did not appear. We called Tyler and Zack over to see if they could help. They played with the extension cords and the outlet switches, but still nothing happened. We all looked at each other for a second. Zack immediately grabbed his notebook and began writing down the key points of the presentation. Katherine went over to the big paper and started to write the PowerPoint out for display. Our worst fear of not being able to show our presentation and powerful images of the park during the meeting was unfolding before our very eyes. Naiela noticed us struggling in the front of the room and came over to see what was the matter. We explained that the projector was not turning on. We tested it in using all of the outlets in the room, but still it did not work. Naiela went to the front office to ask Maria for help. She came into the room and walked straight towards the electrical box. She flipped some switches and the red light on the projector came on. We were back in action. Maria explained that the lock on the Community Centre gate had been stolen and they also took the door to the electrical box outside, leaving the wires exposed in the rain overnight. Once the projector was turned on and the PowerPoint was displayed on the wall, we decided not to touch it until the meeting started in case something was to happen again. At 7:15 community members began trickling in. Brian Watkyns, the ward councilor, sat down next to Basil Tommy in the front row. Cecelia Fouchee introduced herself as the Chairperson of the Residents Association and found a seat towards the back. As we waited for the clock to turn 7:30, people walked over to the display boards and began discussing the presented options on their own. Brian Watkyns, Basil Tommy, Scott, and Zack began a discussion in front of the adult board with the display of barrier options. Zack explained our ideas on fencing based on the research we did on natural park design. He and Scott presented the different options such as the cement wall with tree planters that could act as a barrier to stop children from running into the street and as a place to sit. At the end of the conversation, Brian Watkyns said that he was open to financially supporting different options aside from the standard steel palisade fence as long as the community was in support. At 7:30, Naiela called attention to the front of the room to begin the presentation. She introduced everyone involved in the redevelopment process, including herself, Ronell, Abdul, and the City of Cape Town Parks Department. She introduced us to the community and we took it from there, continuing with further introductions. While thanking specific people from the city and Parks Department, the projector turned off. We were sitting in the dark. Jude flipped on the light and we ran over to the projector as Maria walked over to the electrical box. Thankfully, Brian Watkyns took this opportunity to stand up, introduce himself, and discuss the funding for the park. Prior to this moment, we had thought that there was R100,000 available for fencing to be spent this year. However, Alderman Watkyns discussed the availability of an additional R100,000 for new equipment to be utilized this year as well. This was news to us and we plan to continue with design plans with this recent discovery made from the meeting. The projector turned back on and we were back to the presentation. We continued by bringing the community’s concerns to the table. When the projector shut off again we decided it was time for the interactive discussion groups. We broke down into groups, toddlers/parents, youth, and two adult/elderly groups. Each group discussed what was on their presentation board. After about 25 minutes of discussion, a member from each group stood up and shared their ideas with the community. There were some great ideas presented that we had not considered. For example, the youth group proposed converting the basketball court into a netball court in support of the new team that they are in the process of forming in MGV. They also suggested a snack shack and toilets so that people do not have to run home to grab something to eat or use the bathroom. The toddler/parent group really liked the cement cylinder table and stools so that children and adults could use them to play board games in the park. They also suggested putting in gym equipment near the kiddie area so that they could exercise while watching their children play. The adult groups were adamant about making the park aesthetically pleasing, placing gardens in the park and enhancing the path with bridges. They were certain to include seating so that people could sit and enjoy the park’s beauty, and potentially take their wedding photos there! As discussion began in regards to what other groups had presented, we brought up a factor of the redevelopment process that is going to be vital once we leave Cape Town. We stressed that importance that Perseverance Park is their park, not ours. It is their responsibility as members of Maitland Garden Village to look after the park, keep it clean, stop any suspicious activity, and report to the Parks Department when something needs to be repaired. Discussion grew into specifically who would be interested in being a part of a committee that ensure the implementation of the park redevelopment. Cecelia Fouchee, representative of the Residents Association, expressed her feelings that since Ronell and Naiela have been working closely with us since day one, that the redevelopment of Perseverance Park had fallen under the Green Light Project’s supervision. However, we felt as though this was not the case. We looked at each other and then at Scott, our advisor, as he began to explain the situation at hand. The project had come about when both the Green Light Project and Residents Association came together and decided that the redevelopment of Perseverance Park was something that could benefit the community as a whole, not just one group of people. The fact that Ronell and Naiela have been actively putting time into the project alongside of us, does not take away the opportunity for involvement of the Residents Association. In fact, the steering committee that we are trying to develop would be the perfect opportunity for members of the Residents Association to step up and take a leading role in the process. At the end of the meeting, some people stepped forward to sign up to be potential members of the steering committee. The amount of names of the sheet at the end of the night seemed promising. Moving forward we hope to be able to gather fully committed community members to carry out the facilitation of the design plan, plan future fun days in the park for the community, and keep it a safe place for people of all ages to enjoy. Leaving the Community Centre on Tuesday night we all had a pretty good feeling of how the meeting ran, despite technical difficulties. We were pleased with the turn out with 27 people in attendance. We feel as though we grabbed the community’s attention by presenting the possible equipment options that could be implemented in their park. I do not think that anyone thought that the types of options presented were possible for Perseverance Park. It will be interesting to see who is still interested and ready to work with us after Thanksgiving break. Returning to MGV the following Monday, we reflected with Naiela and Ronell on how they thought the meeting went. Since there were no community members who showed up at our 1 pm meeting that day, they were both discouraged and ready to take on the project themselves. To prevent this from happening we need to determine the next step in forming the official steering committee of Perseverance Park and it needs to be done as soon as possible with only two more weeks left working in Maitland Garden Village.